vapor containing nicotine and flavoring. When I write any article for Volume One, I’m always aware that I need to “keep it local.” That’s the heart and soul of what this publication does. So, when I suggested an article on a new Eau Claire business, E-Cig 53 (a bunch more on that soon), I thought I was going to have to stretch to write about this store and this new industry and still make it all Sconi. Granted, electronic cigarettes – e-cigs, for short – have the potential to free smokers from one of the most deadly addictions humanity has ever encountered ... but that kind of somehow seems bigger picture. The thing is, there is an amazing news story on e-cigs in Wisconsin and we happen to be at the center of it. This is both on a local level with a new niche shop, and at the state level with an international distributor which is setting an amazing example as a Wisconsin employer. 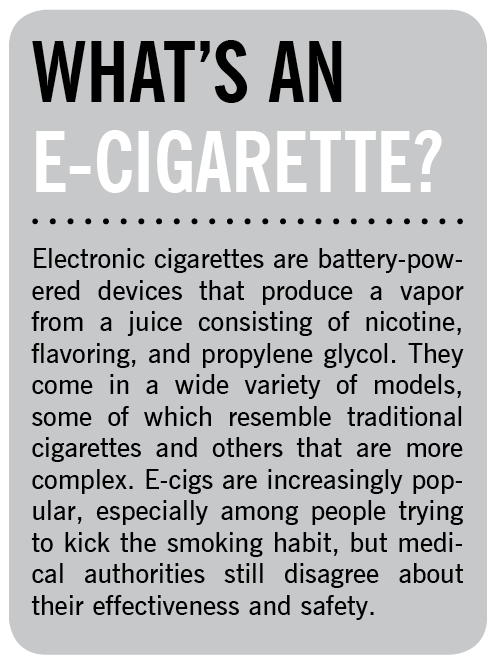 Then, just for good measure this story also has potential legislation on e-cigs that would buck national trends. So e-smoke ’em if you got ’em, it’s going to be a journalistic ride. One look into the display cases at E-Cig 53 makes it obvious just how many options there are for these devices on the market. The options run from a “Vape Pen” which looks kind of like a Sharpie marker to wooden models designed to sit on a shelf to a a new e-pipe that just came on the market. The store also offers many options on the juices for the e-cigs. They even have a flavor testing area where they offer samples of the flavors they mix in the shop, in a way that is refreshingly hygienic. In 2008, Christian Berkey was working on his own innovations to the e-cig industry in the southern Wisconsin village of Johnson Creek. An avid e-smoker, he created Smoke Juice and what has become a major player in the market: Johnson Creek Enterprises. The firm is the largest maker and seller of e-cig juice in the United States and the second largest in the world with retail, wholesale, and custom blend divisions also housed at their headquarters. To make Wisconsin even more unique in the e-cig landscape, state Sen. Glenn Grothman, R-West Bend, has drafted legislation changing how e-cig vapor is regulated in the state. Senate Bill 440 seeks to “exempt electronic smoking devices from the types of smoking devices that may not be used in certain locations.” In short, the bill would make it OK to use e-cigs in bars and other public places where people can no longer smoke cigarettes. This proposal goes against the prevailing national trend in states such as Utah, North Dakota, Arkansas, and New Jersey, where indoor use of e-cigs is prohibited, and other states, where their sale is restricted to minors. So yeah, I guess Wisconsin is kind of a big e-cig deal.